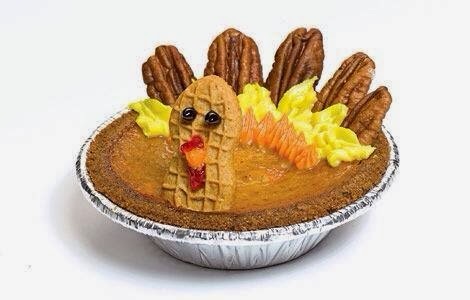 Pierate - Pie Reviews: Happy Thanksgiving 2013! And it’s not far from those thoughts several thousand years ago that Americans and many others around the world celebrate Thanksgiving Day, to give thanks for the food they have. Sure, like many festivals these days, the idea of “Thanksgiving” has been somewhat pie-jacked by the media and food suppliers as a chance to sell off more of their turkeys and pies, but we at Pierate HQ can see right through that and still want to retain the original “Thanks” in Thanksgiving. And perhaps you will be ins-pie-red to share your pie by watching a little video by @KirstyTV and @worldneedspie on the “The joy of pie” – where Kirsty and Beth bake and shares some pie with American citizens for free and share the pie love this Thanksgiving time. Whether it’s Apple Pie, Pecan Pie or Pumpkin Pie in the United States, or even a Turkey Pie like we have in the UK, go on... bake or just eat a pie and share it this Thanksgiving time! HOWEVER WE WANT TO THANK EVERY SINGLE PIE PRODUCER OUT THERE FOR THE PIES THEY HAVE MADE THIS YEAR AND WISH THEM ALL A VERY HAPPY THANKSGIVING! ENJOY THE PIE!!! A Different Taste with Sainsbury's? Are Seriously Tasty Pies seriously tasty pies? Simply a great Beef & Whisky Pie, Simon! Stick some steak in that stilton, ASDA! A frighteningly bad attempt at a pumpkin pie? !